1) VoyagerPro+ – The Voyager Pro is a dual-mic AudioIQ2 noise canceling technology enriches voice quality. Full-spectrum audio at comfortable listening volumes. WindSmart technology blocks intrusive wind noise when you are on the move. 2) Discovery 975 – The Discovery 975 – WindSmart technology aggressively blocks intrusive wind noise when you are on the move. Comes with a rechargeable case can triple your talk time. 3) Backbeat 903 – The Backbeat 903 has Hi-Def music sound technology, dual mic and a bass boost. All for 7 hours of talk time, with a three way fit and flexible design folds up for storage. 4) Explorer 395 – The Explorer 395 is a great blue tooth in a small package. Universal Compatibility, DSP for enhanced audio and a micro USB charging connection. 5) Backbeat 906 – Focus in on your friends and family; listen to music as you exercise. The Backbeat 906 is equipped with a 3.5mm plug on it. Battery has up to 7 hrs listening or talk time. If your deciding between Bluetooth headset models, it never hurts to see what the most popular models are, because chances are other customers have purchased headsets and found what they liked and continue to purchase them. 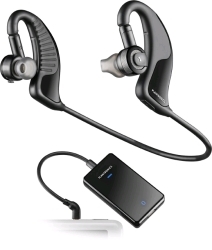 Bluetooth headsets make talking on your mobile phone easier and more productive with your hands free to write or type.